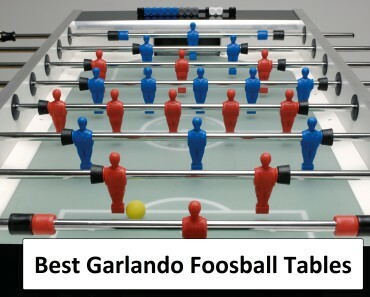 KICK Foosball Table - Find Out Which are Good and Why! All foosball tables ever made has been touted to be better than or just as good as the other manufacturers, and so, with the creation of the KICK Foosball Table, the same confidence applies. 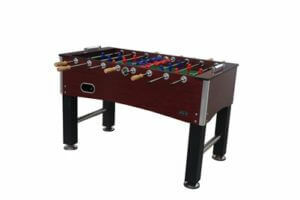 KICK brand manufacturers of products began by an enthusiast of foosball with over 25 years of experience. His vision was for lovers of the game to be able to have fun at home while experiencing playing foosball on a table that is made to last. By investing years of research with engineers and a quality team of creative visionaries like him, they have come up with the KICK brand. 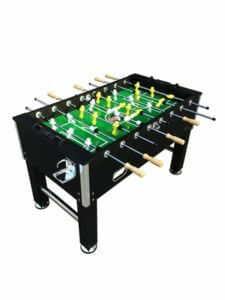 There are five foosball tables in the KICK brand which comes with features you will certainly like; especially for the price, they are being sold. The KICK Legend Foosball Table is an ideal purchase for the home. As a full-length table at 55 inches, it is the perfect fit for any game room. The table is built from the most durable wood with a refined wood grain feature and finish of the highest quality, to enhance and complement your décor. 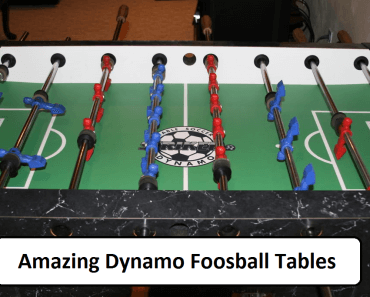 The design is one of the most sought-after feature of this foosball table and because it is made based on the old-school style design, you are truly being treated to an experience of a lifetime. 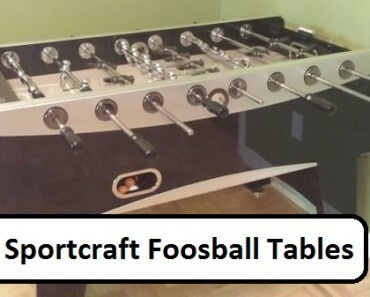 This foosball table is ideal for the family because of its complimentary design. It looks more casual and not vintage as the Legend does. It will fit into any room, whether the games room or family room or even the teens’ room, as it will not look out of place. Its butcher block style design with the black finish gives this table a sense of being pricey which the farthest thing from true is the reality. 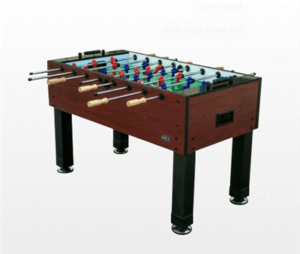 Many persons prefer this foosball table of the KICK brand, as there is more value for money which may be had. Rated at 4.9/5 Star, you cannot find a better foosball table for the home. Like the KICK Triumph, the KICK Splendor Foosball Table is similar in made and presented. The only difference is color and the cup holders. The measurements and technical dimensions are all the same which really makes it a convincing sell for persons who wish to purchase a foosball table for their home. Cost is relative based on the quality table you will have on purchasing the KICK Splendor. 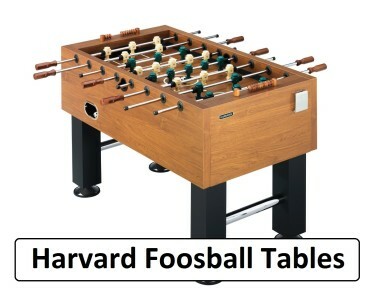 For the KICK brand Foosball Tables the consensus is the main feature of their butcher block design. 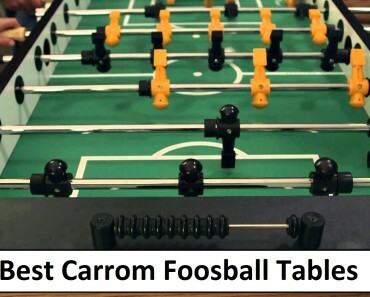 The KICK Splendor Foosball Table has been compared by many persons to be similar to the Carrom brand model foosball tables. This is really a good thing as if you love the Carrom style built foosball tables and want something similar within your price range; then, this is perfect for you. The Royalton is affordably priced and is built as sturdy as foosball tables come, which are made for the home. Color comes in brown like the Splendor and also is made in the same technical dimensions, and has a silver finish at the cup holders as well as the side edges of the table, which gives it a very classy and high-end look. You will not feel cheated on purchasing this model table. Everything you need as well as the easily blended color to your décor is ideal for any game room or family room. 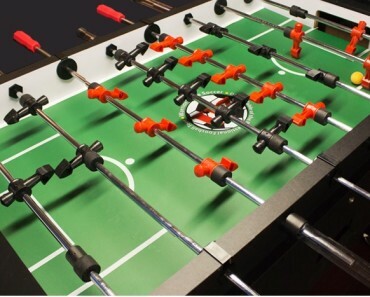 If you are looking for a quality foosball table that will help to enhance your playing skills as well as be a great conversation piece; then the KICK Ambassador is the ideal table for you. It has the features like a tournament style table and it is also built to last. The Ambassador has a mahogany finish with a sturdy cabinet which is excellent to withstand any rough playing. Sturdy and powerfully built legs with leg levelers that can be adjusted for level playing on any surface. The playing field is built with first-class balance and for an easy dribble of the counterbalanced playing men as well as precise and sleek ball return. Rods are made from solid steel and are supported with premium bearings; the handles are made of non-slip grip wood and have safety caps attached. 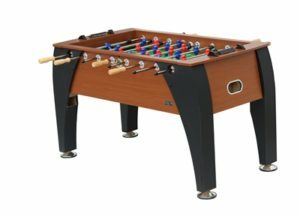 Manufactured dimensions are 55 inches L x 30 inch W x 36 inches H. Like all the KICK Foosball tables they come with Lifetime Warranty. The invention of foosball began the new era of how we look at the game of Soccer. It has encouraged many enthusiasts to become more enthused about the game by enabling them to enjoy through playing foosball.